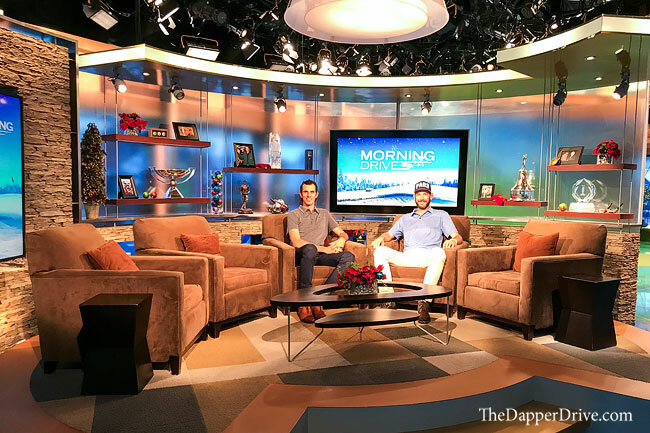 Back in January, I shared a behind the scenes look at my first experience on the Golf Channel’s Morning Drive (read more about that here). 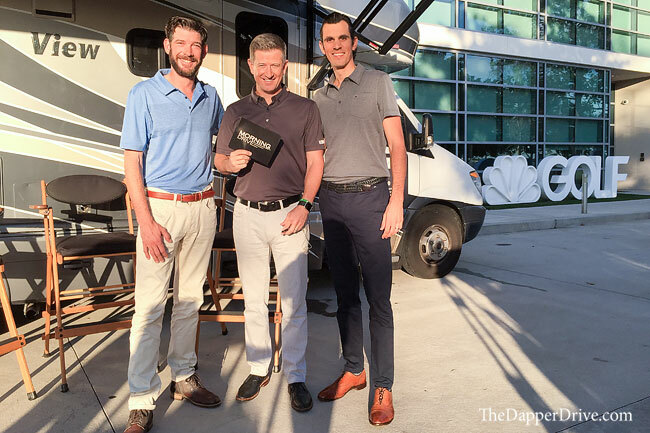 At the time, Brittany and I were just embarking on the Ultimate Golf Road Trip and appeared on the show to talk about the trip itinerary, goals, and how exactly we’d manage life on the road in 150-square feet. 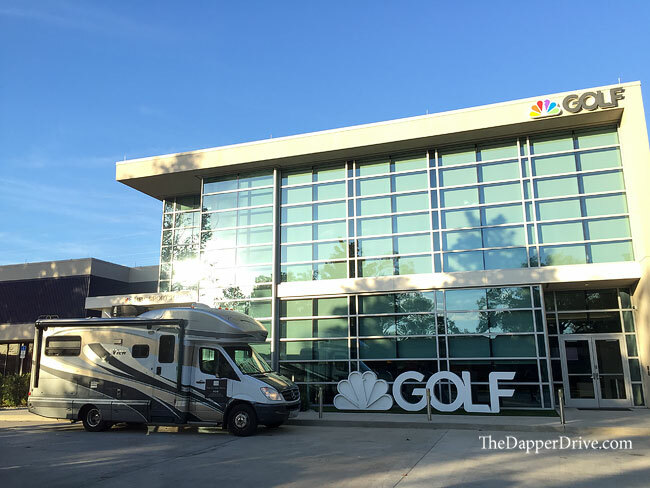 Fast forward 11-months, and I found myself back in that same Golf Channel parking lot, spending the night in our Winnebago View ahead of another Golf Channel Morning Drive interview with Matt Ginella. The scene was similar but circumstances a bit different. 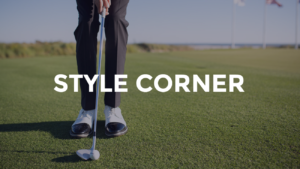 This time I’d be appearing with friend and fellow golf traveler, Matt Cardis, to talk about the Sprint to Streamsong — our 10-day East Coast golf adventure that found us racing from New York to Florida, playing a medley of golf’s gems and giants along the way. A 6AM wakeup call (literally) from a producer initiated another morning to remember. 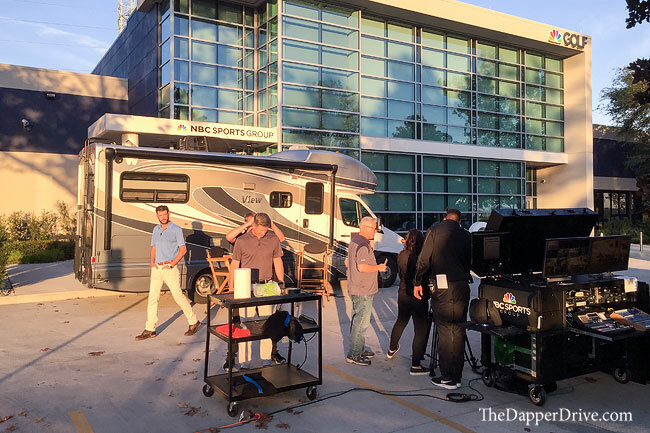 After parking the RV for the team to setup cameras and audio, bumming a shower in the Golf Channel gym locker room, getting the “hollywood treatment” in the makeup room, and taking Mr. P on a quick morning walk, we were mic’ed-up and on air. As I’ve found out on prior live interviews, those 5 minutes sure go by quick! 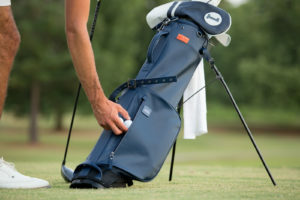 Watch this Golf Channel Interview Here! Our TV time may have gone by quickly, but we weren’t quite ready to leave just yet. 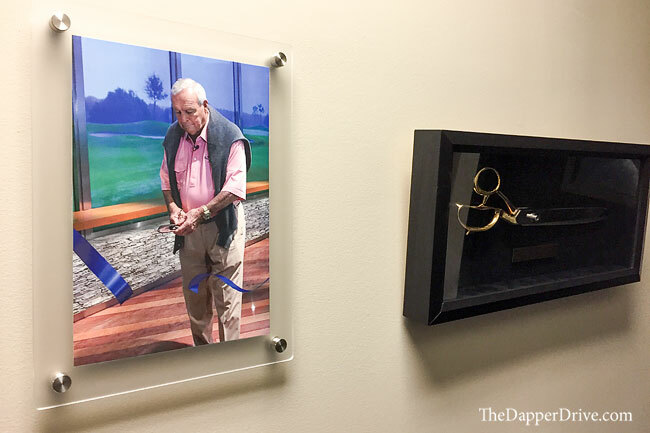 I took a quick tour of the Golf Channel Studios in January, but Matt was eager to check them out himself. To our delight, we were offered a proper tour by longtime veteran studio manager Ken, who had been a part of the Golf Channel team since it’s inception in 1994! 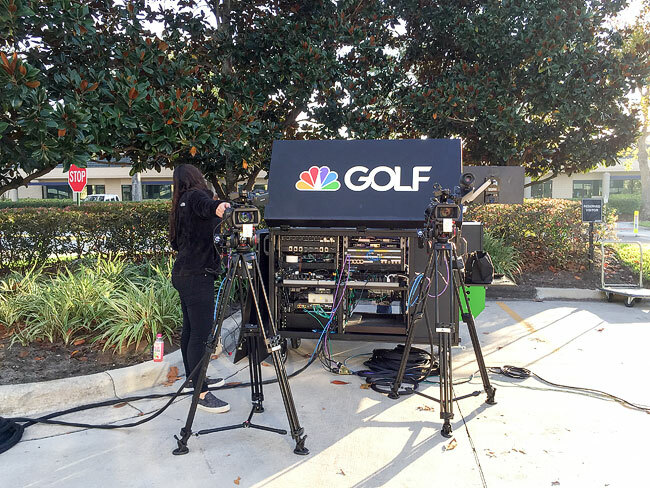 Here’s a quick look at what’s behind the scenes of every one of those newscasts and instructional episodes you see daily on the Golf Channel. While waiting for the Morning Drive to conclude, we voyaged out from the “green room” in search of a Starucks coffee machine we’d seen in the hallways earlier in the day. A few wrong turns and we were clearly lost! To our delight, we bumped into Matt Ginella, who insisted we had to check out Arnie’s Cafe. I knew Arnold Palmer had been a fixture on the Golf Channel for years, but what I hadn’t realized is that he was actually a co-founder of the Golf Channel. As the friendly Ginella lead us up a flight of stairs to Arnie’s cafe, he shared stories of Mr. Palmer’s presence and eventually showed us around the employee’s go-to cafe. 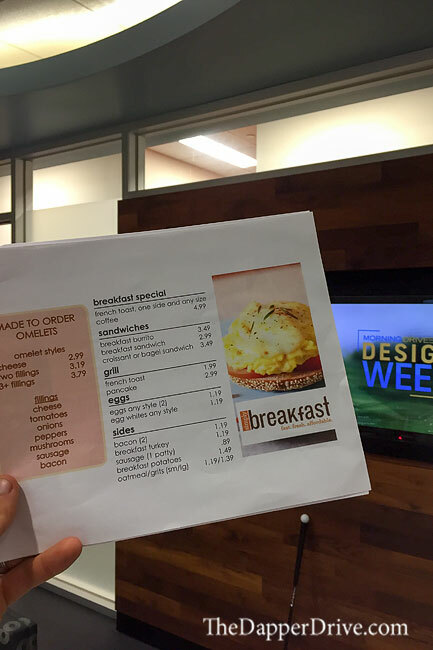 Arnie’s Cafe was born in honor of the King, offering a ton of delicious food items on site for employees to grab a quick bite, or to come together and hang out at all hours throughout the day and night. The spot itself is vibrant and colorful, and the menu is super affordable. After devouring a breakfast sandwich, I can attest that the food is dynamite, too. We parted ways with Ginella and began our tour with Ken. First up was Studio A, where many of the shows you likely watch are filmed. 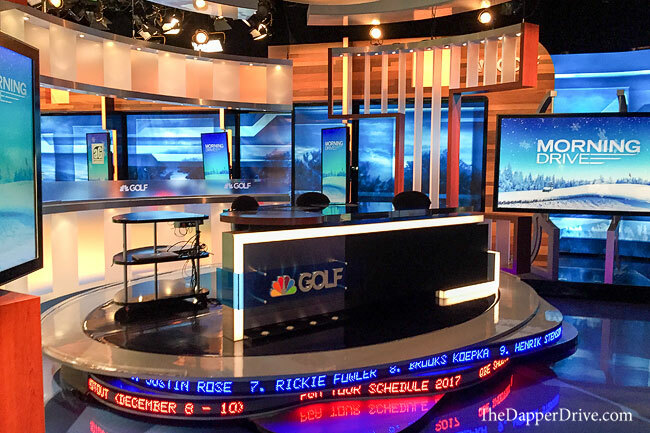 The breadth and technology of Studio A is impressive and features several different sets that can be maneuvered around depending on the show being filmed. 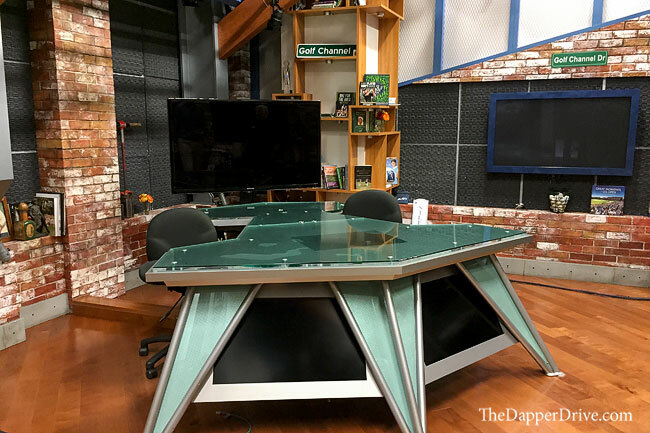 The Morning Drive’s comfy chairs sit front and center at the studio entrance, while Golf Central’s main booth is centrally located and can be shifted around to feature a number of different backdrops. One of the coolest spots is the simulator area, where instructional shows are filmed. It’s all custom built, state of the art equipment produced solely for this studio. 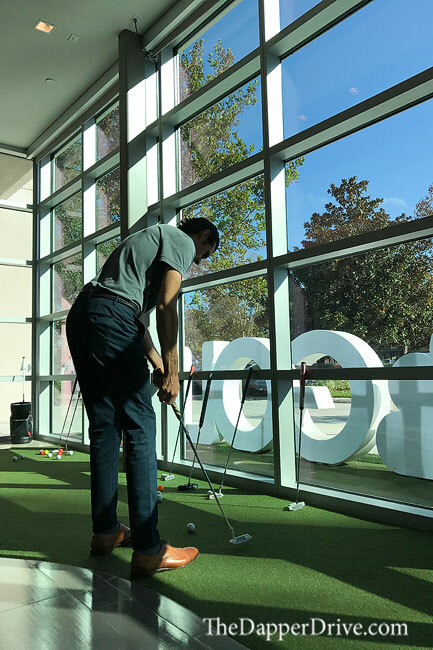 The simulator features a netting made out of military grade fabric — an upgrade resulting from one too many long drive champion guests ripping golf balls through regular netting (and screen!) — while the adjacent putting green has a hydraulic under the surface allowing the green to be set-up for any type of putt you can imagine! 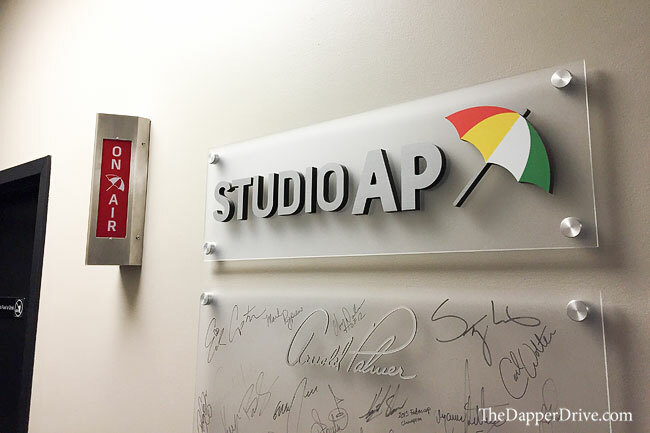 Studio AP was named after the man himself — Arnold Palmer — and is also used for various segments of Golf Channel shows. 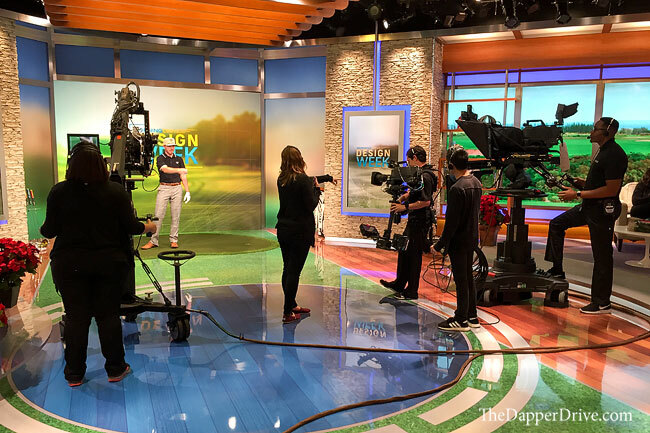 During our visit for Golf Channel’s Design Week, we watched as some filming took place for a segment that featured a few up-and-coming clothing brands. 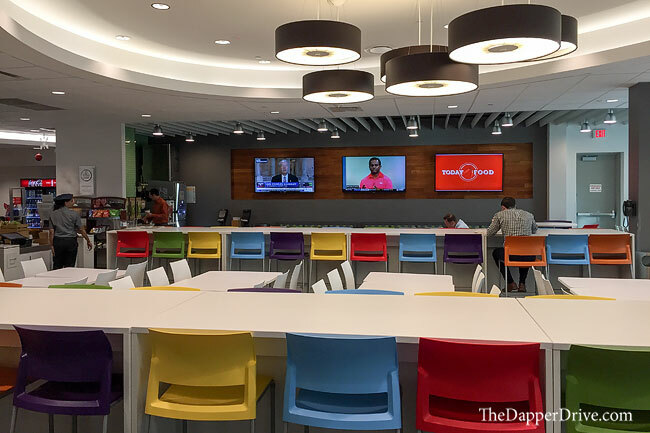 Studio AP isn’t quite as expansive, but has plenty of room for a variety of uses. 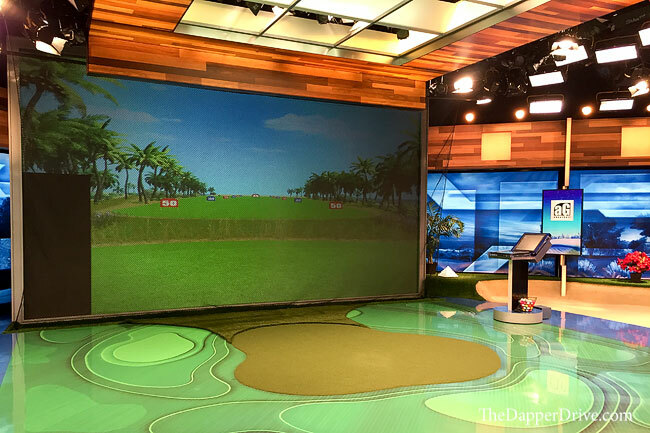 As cool as Studio A and AP were, I think my favorite was a look at the original Golf Channel studio. If this were an NYC apartment listing, “charming” would be the first keyword in use. Exposed brick, tight quarters, and limited equipment make up the super-cool digs. It’s not used a ton anymore, but some segments and recording do still take place. I’m thinking that once Brittany and I settle down from all this traveling, I make an offer to convert this to The Dapper Drive headquarters! I can dream, can’t I?? As we made our way into the area where Golf Channel producers, talent, technicians and supporting staff sit, I was reminded a bit of my trading floor days. Void of any walls or traditional cubicles, desks sit side-by-side in the open concept floor plan. It was still early, but the area was already buzzing. Morning Drive personalities sat huddled in the far corner — likely reviewing the day’s segments and brainstorming ideas on how to continue to elevate the already entertaining show — while others were busy at work all around. Making our way toward the main entrance/exit, last up was a look at a wall outlining significant events in the world of golf. 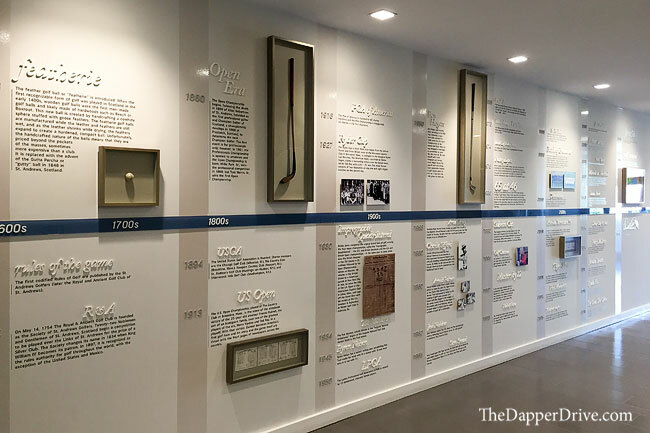 It was cool to reflect on how far the game has come since the 1600’s, and how the Golf Channel has evolved since it’s own inception in the early 1990’s. 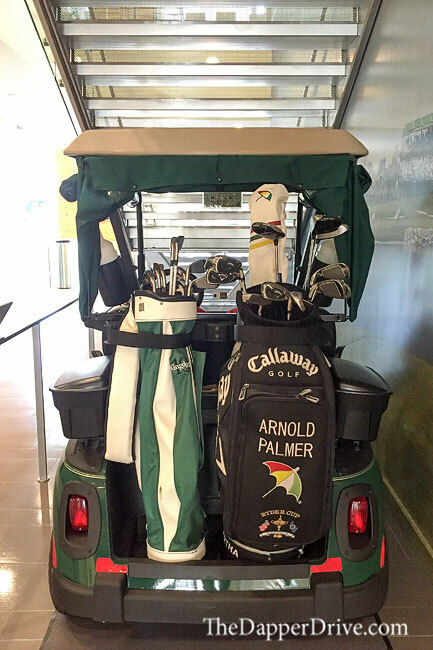 We also got to check out Arnie’s golf cart, which was recently donated to the Golf Channel. An iconic figure that we’re reminded may be physically gone, but will remain ever-present in these hallways. Thanking Ken for the incredible tour, we turned to the main lobby putting green for our final act of the day. Golf has always had a profound effect on me, and this moment was no different. 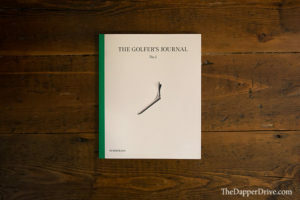 Rolling a few putts, I reflected on how grateful I was to be experiencing something I’d always dreamt about. I thought about the risks I’d taken in recent years and the challenges I continue to face and strive to overcome in growing The Dapper Drive brand today. The memories traveling America with Brittany, and countless experiences on amazing golf courses over the last two years were top of mind, too. Wise words from a wise man. And a reminder that sometimes taking risks, can make all the difference in the world. Thanks Arnie for the words, and to the entire NBC Golf staff for their hospitality.